The UNP Leader of the Central Province S.B. Dissanayake said that President Mahinda Rajapaksa released the country from terrorism. None of the heads of state of this country have not been able to accomplish this task. He said that President Rajapaksa has won the war. 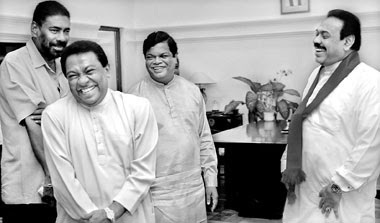 The other heads of state such as J.R. Jayawardena, R. Premadasa, D.B. Wijetunga, Chandrika Kumaranatunga and Ranil Wickremasinghe have failed in this task. The war that prevailed for thirty four years affected the future of this country and that of the children. Parliamentarian Mano Ganeshan addressing the function at the formation of the United National Front at the Parliament complex also stated that President Rajapaksa was the only President who could end the war. He said that J.R. Jayawardena made an attempt and then came President Premadasa. President Wijetunga, Chandrika Bandaranayake, Ranil Wickremasinghe also attempted to solve this issue, although they were not successful. The war was carried out militarily and while maintaining peace. Today the war has come to an end. There is no terrorism. Separatism also does not prevail as a force in the north and east.